The United States Chess Federation - Julia and Eunice Win Polgar! 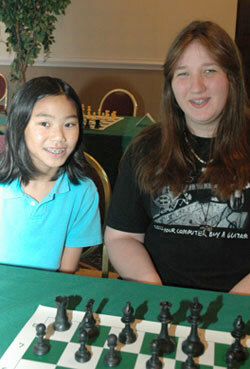 Home Page Chess Life Online 2007 August Julia and Eunice Win Polgar! Julia Kerr of Queens, New York and Eunice Rodriguez of Miami, Florida tied for first in the Susan Polgar Invitational for Girls. (July 28-August 3, Cherry Hill, NJ) The two co-champs and third place finisher Louiza Livschitz all earned 4-year, full scholarships to Texas Tech University. Next year, the Polgar will be held in Lubbock, Texas at Texas Tech University, where Susan Polgar is moving in her new role as the Executive Director of SPICE, the Susan Polgar Institute for Chess Excellence. Megan Lee of Seattle, Washington won the Ursala Foster award ($500 cash) for the top girl under 14 years old. Megan's coach is Elena Donaldson. The top finisher on tiebreak, Julia Kerr, also has a female coach: none other than Susan Polgar! Julia regrets that because Susan is moving to Texas, she won't be able to work with her soon. Julia, an incoming senior, has earned a 4-year scholarship to Texas Tech with her victory, so maybe she will reunite with her old coach soon enough. Julia's crucial game was in the last round against Louiza Livschitz, who was half a point ahead of the field prior to the game. A view of the the Polgar/Denker tournament hall, with co-champion Eunice Rodriguez in the foreground. Eunice flanked by supporters of her victory, NM Elliott Liu and USCF expert Scott Lalli. Third place finisher, Louiza Livschitz from Northern California. A thoughtful look on a Polgar participant just before the final game. The Denker Tournament for High School Champions and the Susan Polgar Invitational for Girls were held in the same room, with alternating boards. Pictured here are 2nd place finisher Tony Cao from the Denker and Ettie Nikolova, the only USCF expert in the Polgar.